There are many ways to support our students! Thank you for considering making a gift to the Educational Excellence Foundation. There are many ways to support our students! EEF accepts gifts of cash or cash equivalents, marketable securities and in-kind gifts of personal property. The EEF appreciates every dollar donated and works hard to keep overhead to a minimum. We use donated office space and part-time staff. 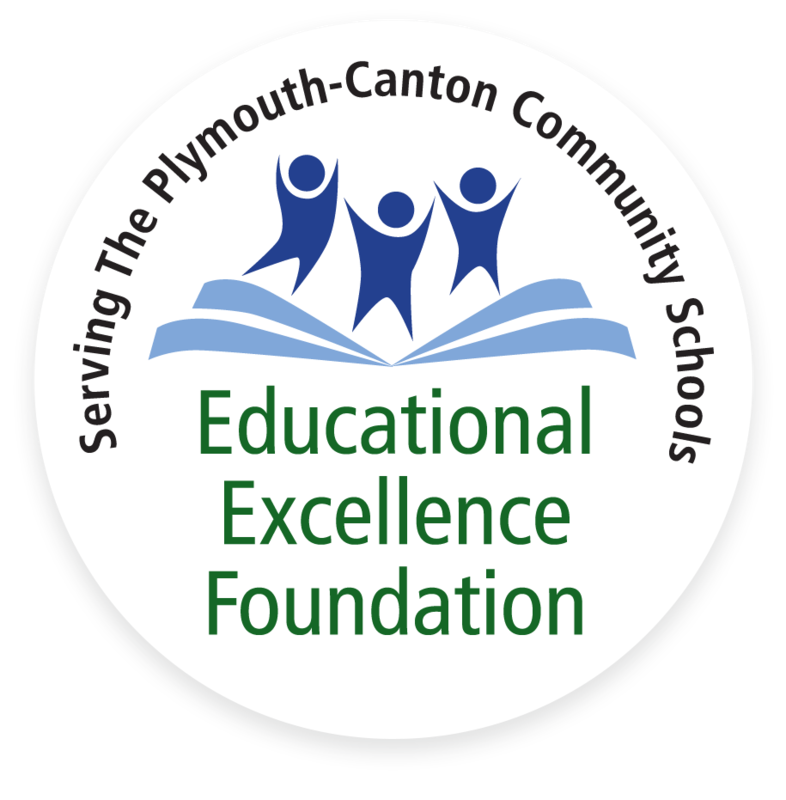 Your contributions are used for the express purpose of enhancing education in Plymouth-Canton Community Schools (P-CCS). All donations are eligible for tax deduction consideration. The Educational Excellence Foundation is a registered non-profit 501[c] organization. Cash donations may be made in-person; by mail; or anytime online by clicking HERE. Send a check to Educational Excellence Foundation, 454 South Harvey Street, Plymouth MI 48170. The Educational Excellence Foundation regularly works with family members and friends who want to memorialize or honor someone through gifts to the Foundation. We will be happy to assist you in creating a new fund or supporting an existing fund to recognize your loved one. When individuals and companies make annual, unrestricted gifts to support the general funds of the Foundation, they make it possible for investment earnings to be devoted to supporting our scholarships and youth programs. These gifts are the lifeblood of the organization. They allow the Board to direct resources towards the programs and activities that are most important to workforce development at any given time. Regular annual giving by friends and support of the Foundation is critical to our ability to operate the Foundation efficiently and effectively over the long-term. To make an Annual Gift anytime, please click HERE, or respond to a solicitation you received from the Foundation. EEF manages a portfolio of endowed funds. These funds were established by gifts with the intention of the donor to have an enduring impact on the education of students in P-CCS. The earnings generated from these funds are used in perpetuity to provide either general support or designated support. With an endowed fund, the principle of the gift is invested for long-term growth and cannot be invaded. A portion of the annual investment earnings is used to fund the program, project or scholarship. Currently, the spending rate for the endowment fund is 5.0 percent of the average market value of the fund measured quarterly. This rate is set by the Foundation Board of Directors and monitored by the Board’s Investment and Finance Committee. To create a named, designated endowment fund at the Foundation, a minimum gift of $10,000 is suggested. Besides annual operating gifts and long term investment endowment gifts, the Foundation offers donors the opportunity to invest in several special projects, scholarships and managed awards programs. Numerous corporations and foundations have invested in youth outreach programs through annual grants for youth programs in areas near their facilities and/or scholarships for P-CCS students. We will be glad to share program options with you. A gift to the Educational Excellence Foundation that is part of a thoughtful, comprehensive estate plan provides a way for you to complete a lifetime of giving or make a significant gift that was not possible at an earlier stage of life. Planned gifts also provide advantages such as a guaranteed lifetime income and tax benefits. Does your company match charitable donations? EEF qualifies for most company match programs. Please send us your paperwork along with your donation and we’ll do the rest! Some gifts may require review by the EEF Board of Trustees including tangible property that is not readily marketable, real estate, closely held and S corporation stock, partnership interests, life insurance, etc. EEF reserves the right to refuse any gift that it believes is not in the best interest of EEF or P-CCS or is not in alignment with the Foundation's mission. Help us Create the Future. To learn more about any of these giving options, please contact Gretchen Ward, Executive Director at 734-416-2718 or gretchen.ward@pccsk12.com.